(J&K) JKBOSE Junior Assistant Admit Card 2019: Recently Jammu & Kashmir State Board of School Education has invited the online applications from the eligible candidates of Jammu and Kashmir to fill the posts of junior assistant. A large number of candidates have filled their online applications and now looking for JKBOSE Junior Assistant Exam Date and admit card 2019. JKBOSE JA 84 Posts Exam Date, Call Letter: Jammu & Kashmir State Board of School Education will soon issue the Admit Card/Hall Ticket for the posts of Junior Assistant on the official website of JKBOSE www.jkbose.ac.in. Those candidates who have applied for JKBOSE Junior Assistant Recruitment 2019 in past will be able to download the Admit card/Call Letter. Please read the below-given instructions to find out how to download the admit card/call letter, Exam pattern and selection procedure. Dear candidate, the admit card for the posts of junior assistant has been yet to release. All the candidates who are searching for the Jammu & Kashmir State Board School Education Junior assistant Call Letter 2019, can wait till the admit card released. Soon JKBOSE will upload the Admit Card on its official website and the downloading link for admit card will be activated soon. JKBOSE Junior Assistant written Exam will be held in April 2019 (Not Fixed). 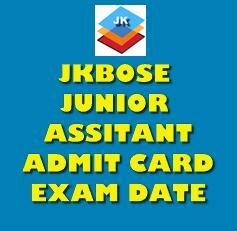 Please visit this page regularly to check the details regarding JKBOSE Junior Assistant Admit Card and Exam Date. Dear applicant, as we all know that admit card is an important document to enter in the examination hall. Therefore, we have advised the candidates to keep ready a printout of admit card with other important documents. 1. Log in to the Official website www.jkbose.ac.in. 2. Login with your ‘Registered User ID’. 3. Click on ‘Junior Assistant’ Admit card link. All the candidates who have successfully submitted the JKBOSE Junior assistant application form and now waiting for the admit card/call letter, will be able to download the e-Admit card/call Letter from 7 to 10 days in advance. When the Jammu & Kashmir State Board of School Education issues admit card, we will update with full information here.